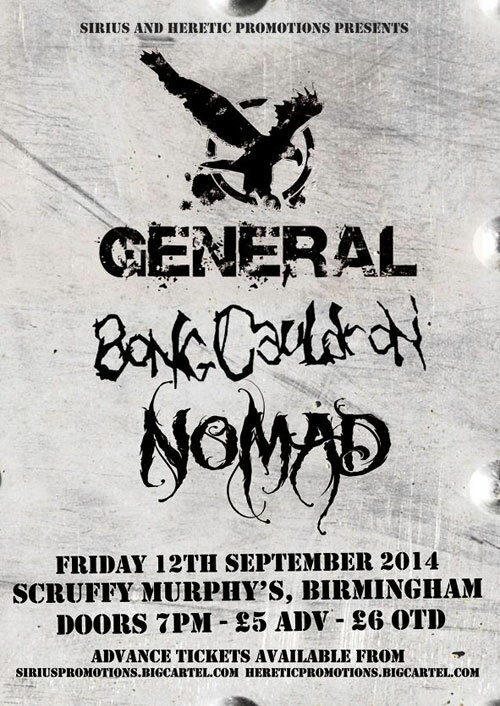 Coventry’s Stoner Groovemasters GENERAL, who recently supported My Ruin at the O2 Birmingham and had an amazing home town gig at The Arches only a couple of nights ago, have now announced another headline set, this time at the legendary Scruffy Murphy’s in Birmingham. Organised by Heretic Promotions & Sirius Promotions, GENERAL will be playing material off their soon to be released second album and the show is a chance to hear the direction the band are heading in with a clutch of new songs. The gig takes place this Friday, 12th September at Scruffy Murphy’s, Birmingham, tickets are £5 in advance, available from Sirus Promotions webstore or £6 on the door, and also don’t forget to check out the Facebook Event where all the latest news will be posted. So if you saw GENERAL at the O2 Academy and enjoyed the show, here is another chance to hear more.